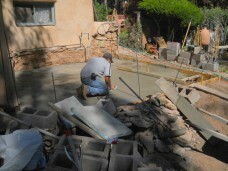 To learn more about an innovative adobe home renovation, I drove from the bustling city of Albuquerque into the hills south of Santa Fe, as pinon trees, brown clay hills and buttes soon dominated the view. Various types of adobe structures stood proudly in the gleaming New Mexico sun. The Quonset hut addition was warm and filled with light. It was rejuvenating to visit and experience a beautiful house as well as be in the company of people who take pride in what they build and where they live. A gleaming Quonset hut graces the top of the hill that was at one time the mission and village square that was the bustling center of Galisteo. 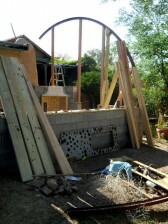 The Quonset hut addition was attached to the the older adobe house. The kitchen sits to the left hand side of the picture. In this home renovation, a translucent Quonset hut was added to a centuries old adobe house. The addition fills with light during the day, while it becomes a glowing orb on the hill at night. 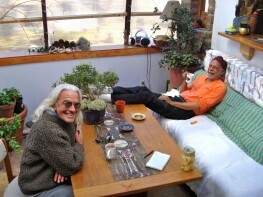 I visited on a cool November day when clouds alternated with strong sun. 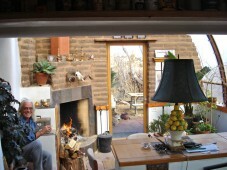 Upon entering the house, an immediate sense of both warmth and light enveloped me. Certain homes simply feel good. This space emanated warmth and light. A Rumford fireplace, designed to emit a maximum amount of heat, graced the corner of the home. The Rumford fireplace was originally engineered by Sir Benjamin Thompson, Count Rumford, who studied heat radiance in the late 1790s. He advocated smaller and shallower fireplaces that were curved to allow them to both radiate heat into the living area and allow the smoke to easily escape. 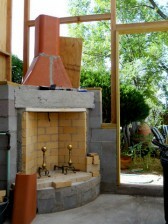 In addition, the stove is built into a wall of thermal mass. It kicks out serious heat. Additional pictures of the Rumford stove can be seen in the gallery below. 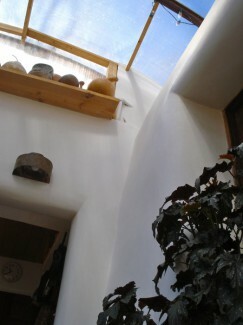 The winter sun strikes the north wall of the house to warm its thermal mass. The Quonset hut was built to the north of the original adobe structure. 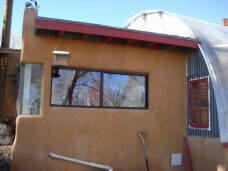 Initially, my passive solar schooling resisted the idea of building anything with glazing to the north, yet for sunny, hot New Mexico, it makes perfect sense. Because the Quonset hut is located on the north side of the house, it won’t get as hot as it could in the summer. Although it does get plenty hot, up to 175 degrees Fahrenheit. Because of this, they are looking into types of covering for the summer. In the winter, however, the space is warm and filled with light. 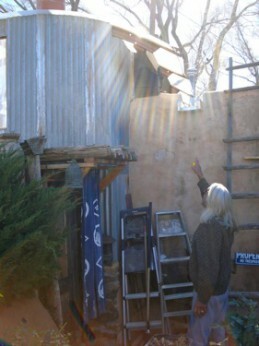 The passive solar aspect of the house is fulfilled as the winter sun strikes, warms, and is absorbed into the (southern facing) north adobe wall of the house. 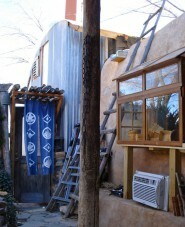 They used pressed adobe bricks that were mortared with adobe plaster. 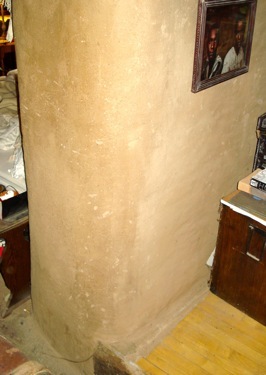 They left part of the adobe wall rough and contrasted it with a smooth, white plaster. A white diamond plaster finish reflects the light in the Quonset hut. 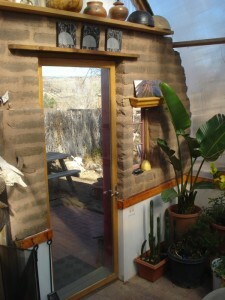 The home stayed true to its New Mexico adobe architectural roots with its thick, curved walls. The smooth ‘white diamond’ plaster finish reflected the light nicely. As I gawked at the house and listened to David and Eric, it dawned on me that they have a type of wealth and ease that most people dream of. 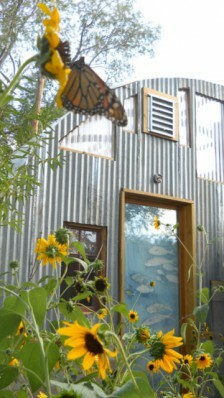 They designed and built a house that meets their desires and needs. 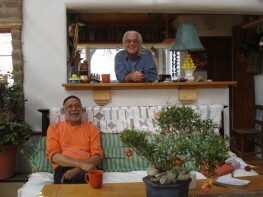 It is a comfortable space that allows them to pursue art and leisure. Eric made some breakfast while enjoying the view. 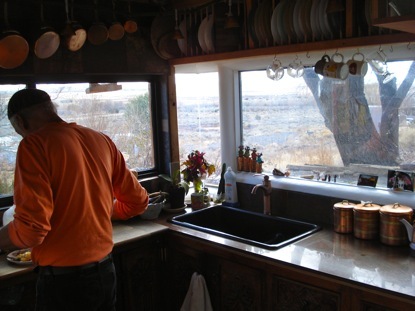 A kitchen was built to the south of the Quonset hut. The kitchen windows allow for a 180 degree view of the valley below. The kitchen was designed with utility, practicality and beauty in mind. The dishes are washed and placed into the drying rack above the sink. 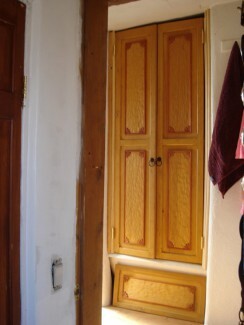 That is also where the dishes are stored, thus, they don’t need to be moved after they are dry. Overall efficiency was built into the house. It’s one of the luxuries that owner-designer-builders have. The kitchen with an ingenious dish drying / storage rack. 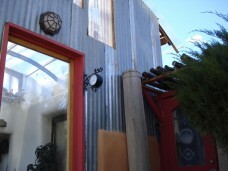 A large portion of the items used in the retrofit build came from reclaimed and salvaged materials. 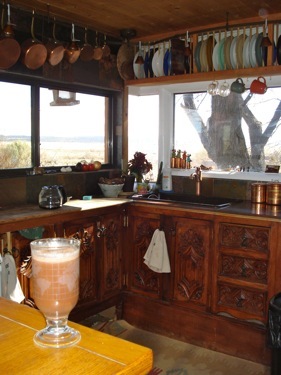 The cup of hot chocolate sits on a counter top was once a table leaf, while the beautiful hand-carved cabinets were recycled from an old armoire. Some visitors comment that the kitchen feels like a boat. Indeed, the utility, functionality and windows make one feel as if at the helm of a yacht. The view differs in that one looks out at the vast desert instead of at the sea. 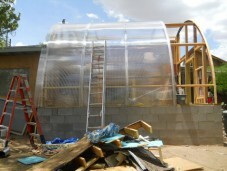 The polycarbonate was placed onto the Quonset hut frame. The process of building the Quonset hut addition took about 3 years and $20,000. 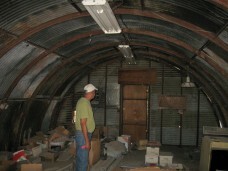 The old army-built Quonset hut was purchased in Albuquerque for $1000. They disassembled and hauled it to their location. They poured a 2-foot slab foundation, then built a 3′ wall of concrete block to set the east-facing side of the Quonset hut frame on. 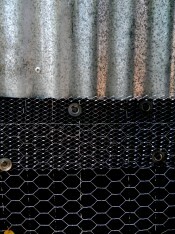 4 – 24 x 4 foot polycarbonate panels were attached to the Quonset hut frame. 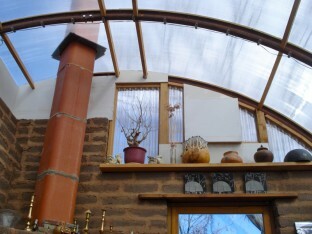 The polycarbonate they used is a thick, translucent material that has channels of air within it that aid in the structure’s insulation, while it allows solar heat and light into the house. 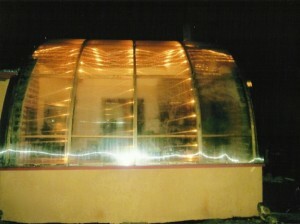 The polycarbonate has been treated with a UV protectant and is warrantied for 20 years. 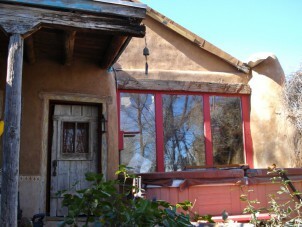 Adobe homes typically have thick walls. 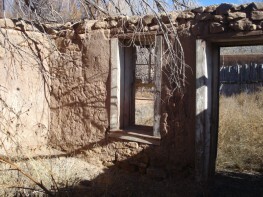 The older adobe house has thick walls that help keep the house cool in the summer, and once warm, help it to retain its heat in the winter. 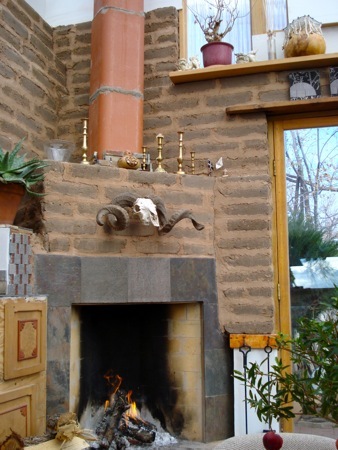 Adobe is one of the oldest building materials around. 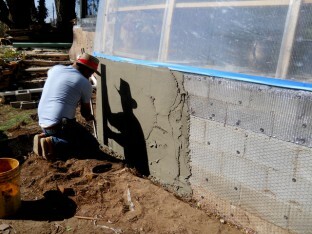 It is tremendously strong and the ultimate green building material. It is biodegradable (because it’s mud) while having longevity. 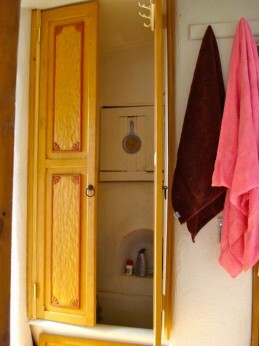 The original house was built in the 1800s. It is a lovely house renovation that uses passive solar building elements with a south facing wall that absorbs and radiates heat. 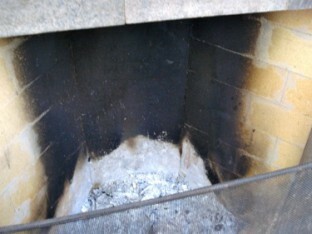 They built an efficient Rumford fireplace for the times when extra heating is needed. It’s always nice to see people who love where they live. I count myself lucky to have been in their company. 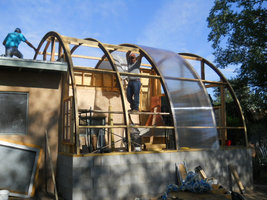 Take a look at the gallery to see more photos of the Quonset hut-adobe home renovation. The translucent Quonset hut was a nice space. 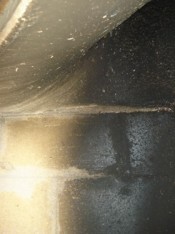 A Rumsford fireplace, designed to emit a maximum amount of heat, graced the corner of the home. Remodeled kitchen with ingenious drying / storage rack. A white diamond plaster finish reflects the light. This article was based off of a submission to GreenPassiveSolar. Great article. We need more quonset huts apparently. Absolutely! Quonset huts are awesome. This one was cool because of its translucent nature. love to hear where to get the translucent panels. I have a similar project in Arkansas. I believe they found the translucent panels from a greenhouse supplier. I would really love to know the exact type of polycarbonate used ,ie thickness etc as i want to do something similar but am having trouble find information on the thickness of the polycarbonate,would really appreciate a response if you have time. Thank you and what a great house i really love it !! I don’t know the exact thickness, but do recall that it was purchased from a greenhouse supplier.